Finally, my genetic genealogy report, at least for one of the possible thousands of my ancestral lines, has become available. Thanks to my mother's older brother, my uncle Dario in the US, I am now able to chart the journey of my Lucero ancestry through the male line. Or in the case of genetics, using the Y-chromosome. I wanted to trace my Lucero genes first because, personally, I have always been more attached to my maternal family. And since my Lucero ancestry is maternal, I had to make use of an uncle to provide the sample for genetic testing as the Y-chromosome, if we remember our basic genetics class in college, is passed through the male line only. Thus, my Lucero grandfather, Jesus Birondo Lucero, passed on his Lucero Y-chromosomes to all my mom's brothers but not to his daughters, which include my mom. Finally, since among all my familial lines it is the Lucero history that I have fully documented so it has become obvious which line I should begin with. I am the son of Fely D. Lucero, who is the daughter of Jesus Birondo Lucero, whose father was Isidro Ceballos Lucero, whose father was Bonifacio Jose Bayot Lucero, whose father was Jose Francisco Cabrera Lucero, whose father was Justiniano Francisco de Sta. Cruz Lucero, whose father, Hermenegildo Francisco Lucero, was the son of Francisca Yldefonza. The only record that shows the farthest traceable Lucero is the death certificate of Justiniano's sister Mauricia Francisca Lucero vda. de Taguenca-Cabrera where Francisca Yldefonza is listed. No surname is given and the husband is written off as padre de noconocido (father not known). Family lore has always claimed that Francisca Yldefonza was a Lucero who married an indio principalia and thus passed on her surname to her descendants. Indeed, at least 4 documents show that the Lucero surname has existed in Argao years prior to the Claveria surname decree of 1849, a clear indication that the Lucero name, at least in the town of Argao, is a last name that has been passed down and was not adopted based on the surname decree. Because of these I have always believed in the family legend, and now that I have the result of our genetic genealogy I can now say with certainty that Francisca Yldefonza's husband was not Spanish at the very least. A marker, simply put, is a random, naturally occurring, usually harmless mutation in the Y-chromosome, making one branch of a genetic family tree unique from the rest. Because the Y-chromosome remains virtually unchanged through many generations then these markers can be traced easily as they, too, are passed from father to son. M168, also known as the Eurasian Adam, lived in northeast Africa in the region of the Rift Valley, perhaps in present-day Ethiopia, Kenya, or Tanzania, some 31,000 to 79,000 years ago. It is generally accepted that this first man who gave rise to the M168 marker lived about 50,000 years ago. He is called the Eurasian Adam because all modern males today who are not African descend from him. Then about 5,000 years later one of Eurasian Adam's male descendants gave rise to the M89 marker, a marker which is present in 90 to 95% of all non-African males. This person lived somewhere in Northern Africa or the Middle East, and aside from stone tools people were already using wooden and ivory tools. My next ancestor, a man born around 40,000 years ago in Iran or southern Central Asia, gave rise to the M9 genetic marker which marked a new lineage diverging from the M89 Middle Eastern Clan. His descendants, of which I am one, spent the next 30,000 years populating much of the planet. This was already during the Upper Paleolithic era. And then, about another 5,000 years after the birth of my M9 ancestor, a descendant gave rise to the M214 marker. This man was born and lived in Eurasia, likely east of the Aral Sea, and was most likely a hunter-gatherer. This man carrying M214 has become the direct patrilineal ancestor of a very large percentage of present-day humans. 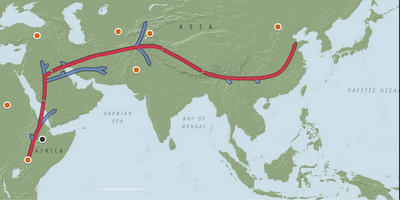 Then finally, about 35,000 years ago my most recent ancestor, the one who gave rise to the the haplogroup O or the genetic marker M175, was born somewhere in Southeast or East Asia. This guy lived during the Ice Age and as I was reading the report by National Geographic's Genographic Project I can distinctly recall my history 1 lesson where a discussion was made about waves of migrants who crossed land bridges to the Philippines but were later unable to return home as these bridges melted or were submerged with water. One of them was my male-line ancestor, whose line continued on until it reached the coastal town of Argao, Cebu, and in the early 1700s one of their descendants married a Hispanic woman, Francisca Yldefonza Lucero, whose son Hermenegildo Jose Lucero married Florencia Visenta de Sta. Cruz and had a son, Justiniano Francisco Lucero, who married Casimira Manuela Hernaez Cabrerz, who were the parents of Jose Francisco Lucero, who married Ambrosia Villarde Bayot and had Bonifacio Jose Lucero, who married Severina Tiburciana Ceballos and who produced Isidro Ceballos Lucero, who married Anacleta Tan Birondo and whose son Jesus Birondo Lucero was the father of Fely Jesus Dolloso Lucero, my mother. As I delve deeper into my genetic genealogy I can feel the echoes of my distant ancestors cheering that I am taking the time to tell their story. I am in awe of God's obvious hand in the history of my genetic ancestry. And I am further convinced that the wars and conflicts in the world are pointless as we all come from the same line. I can't wait to do genetic testing on my other lines soon! People need to understand that ALL lines will go back to Africa. And even today, this data is still limited as it is based on the available data, basically people such as yourself who provides or adds to this pot of genetic pool from which to base info. from. Most importantly, as you pointed out your paternal side, there's usually 1 (for women) or 2 lines that one could trace. More if you're lucky to find that right direct match. For me to trace my Argaowanon side (paternal grandmother), I'll need my aunt to test, or some of my many female cousins or their daughters or grandddaughters or even great-granddaughters to trace that side. Then I'd need a direct male descendant from my paternal grandmother's father to trace my PUERTO lineage but I expect all of them to go back to the same place as yours. In fact, if anyone in my family does decide to do theirs, assuming it is a female, I'd expect it to be somewhat similar to yours, although yours is on your paternal side while mine would be on my grandmother's side. Hi K. Yup, you're right. I was kinda disappointed when I read a journal online that said 75-80% of Filipinos belong to Haplogroup O. So much for being unique! Hahaha. I'm hoping that Ancestry.com will soon have an opening for their new genetic testing which claims that it will test all lines of your tree. In the Philippines DNA project, I saw some J in there. Jewish? Middle Eastern? NOt sure, never bothered to look, but that person must've had family members tested and they listed Aklan as the geographical location. Interesting! Check my tree at herbertholemanj.com as we have DNA matches in commonm.